I'm back where I ended my last walk, in Ilford. This morning feels a little different - arriving by rail into the Town Centre I have only the vaguest memory of how to get to the River Roding. Those first few moments of the bus journey a few weeks back were spent recovering from the deluge I'd been caught in, and the subtleties of the topography were a little lost on me. I sensed I was close though, navigating by the two tall glass towers of Pioneer Point which dominated the view from Redbridge on my last walk. Sure enough, there was the river sliding inauspiciously between British Telecom's Mill House offices and the North Circular. Marked only by a flourish of green between the buildings and a tiny blue sign, the river has calmed to its usual sluggish, benign flow. But as I've already discovered, following the Roding isn't easy or without challenge. The first was to get to the river: passing under the A406 I'm tempted by the concrete slopes beneath the overpass which imply they could provide a walkway at least part of the way to the water. Realistically though, there doesn't appear to be a way beyond the sliproads, so I negotiate some steps down to Grantham Road. Fronted by a series of tall, slightly ominous point blocks shielding it from Romford Road, this Little Ilford estate feels somewhat tense. A couple of older guys chat animatedly on the corner. I overhear a fragment: "feckin' Europe". It becomes apparent as I navigate the estate that Little Ilford is home to immigrants from the world over. It's the very kind of place where BREXIT feels illogical and it's attendant racism cruel - like a double body-blow. I lower my head and press on, passing a couple of young Indian guys systematically walking the streets and checking the wheelie-bins. For what? Between the stubby blocks to the east I spy a dog walker - always a good sign - and at the end of the short street a gateway to the park. 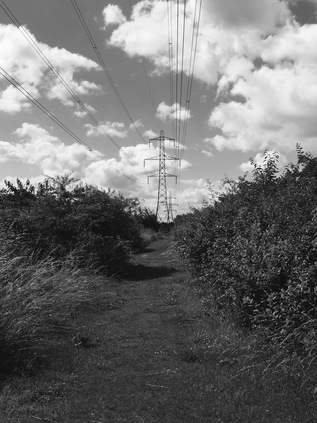 I can feel the A406 reverberating nearby, so I delve into the greenery and find a grassy track which runs directly beside the road, undulating with its embankment and following the line of pylons which began to march alongside me back at Charlie Brown's Roundabout. Just like last time, the river is present but hidden. I'm walking its valley, but not its course. The largely untamed edge of the park is surprisingly bright and warm, and the walking is pleasant. Having a carpet of grass underfoot is a welcome change. It doesn't last though, and I'm eventually deposited onto the gravel track which circuits the much more primped sports field fronting a disused pavilion. A lone gymnast flips and tumbles across the grass as I edge around the park, trying to find a way through to the green space beyond. It turns out there is no way - so, turning back at the tennis courts I'm out onto the backstreets, deposited onto suburban roads named after painters: Reynolds, Dore, Leader and eventually Millais. 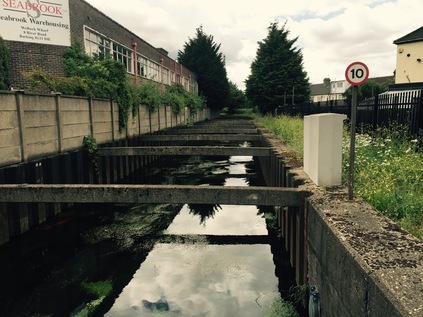 The promise of a route under the A406 isn't delivered - if there is a footpath leading off the uninviting entrance to builders yards and reclamation specialists, it's well hidden indeed. Instead I turn west, heading towards the broad underpass which takes me under the London to Southend railway line. The bridge is wide enough for a road to pass beneath, but is hemmed in by barriers to prevent all but cyclists and ill-advised pedestrians from transiting into Barking. Unexpectedly, between two arms of railway I find the entrance to East Ham depot - a location I'd passed numerous times on the rails above, craning my neck for unusual stock. Once south of the delicate swan-neck of rails, Stevenage Road turned abruptly west to skirt the apparently disused Leigh Road Sports Ground. Rusting goalposts quivered in the wind, almost crossbar deep in reedy grasses. Across the vast swathe of grass the North Circular hovered on its tall concrete legs, with the lush foliage of the river beneath. A footbridge was again promised by the OS map, but there was no access to the sports ground - a notice offering 'multiple hazards' to any who dared. A deflated gasholder and its outbuildings sat defiantly in the midst of the overgrown space and reflected a strong morning sun back at me. There was definitely no way in, or out onto the river. Instead I turned east again along the dusty run of Watson Avenue. One side a high fence, regularly dotted with signs declaring the unimaginable and manifold horrors that would befall anyone trying to access the sports ground, on the other a run of pleasant but tired suburban houses. There's no-one to be seen at all. At the end of the street, a steep footbridge climbed directly over the North Circular. No messing around with tiers of stairs or carefully graded accessibility ramps, just a stepped ascent to the height of a gantry sign. Traffic rushed under a threatening sky, broken with flashes of bright light. From the north, the glassy faces of Pioneer Point winked pale sunlight back at me. This crossing of the road was exhilarating - and it marked a return to the river at last. That return was via the menacing and littered Hertford Road, and a dank, debris-strewn passage beside a Big Yellow Storage Centre which lead to another bridge - this time over the Roding. Here the river was broad and slow-moving, approaching its final meanders towards the Thames. On the west bank, a broad well-made path edged the water. North of here it terminated in a blank wall, but south it appeared to continue by way of the curves of the river towards a gigantic Tesco store. I followed the river path gratefully, not even noticing the faint faecal tang on the air. Surfacing to briefly visit Tesco, I hugged the river wall and edged out of their extensive Car Park beside the Ibis Hotel. I had been here before - and with some confidence I strode along Fresh Wharf Road, passing the inert security checkpoint which had concerned me last time. In the interim I'd discovered it shouldn't be this way. There is, theoretically a route along the west bank of the river - but a dispute between the Fresh Wharf Estate and the owners of houseboats moored at Barking appears to have resulted in it being blocked. While court action has secured them access to their homes, the through-route remains blocked. Instead I turn east again beside the institutional grey block of the Police Custody Centre, heading along a well made path which runs along Hand Trough Creek. Behind the building, hatless but fully body-armoured Policemen smoke committedly between shifts. I emerge at the gated entrance to the moorings and cross the weir by way of the lock gates. I'm finally east of the Roding and with a fairly good path to walk which appears to have been constructed when the modern blocks of flats which front the river were built. I wonder at these places - innocuous, tiny properties packed into serrated blocks which tower above the sluggish channel. The location is promising enough: looking out over the vast sewage complex at Beckton and its neighbouring leisure park offering of American diner and multiplex cinema. Ahead, the A13 crosses on a low concrete bridge, and my pathway is soon pressed up against the wall of the overpass, vegetation hanging above. 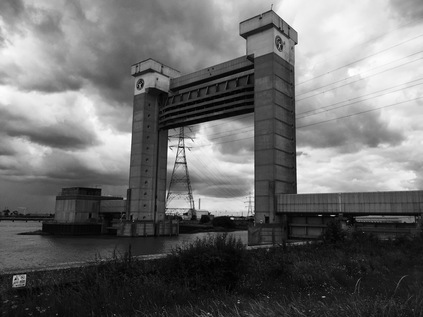 I emerge at the bottom of a footbridge I'd crossed on my A13 walk, the road seething beside me. I felt like I'd come home. It was oddly comforting to cross the footbridge over the familiar surge of traffic, watching my hand blacken with heavy particulate as I ran it along the guardrail. I'd been away from my A13 walk for a while now - trying to determine the logistics of the long rural sections ahead - but seeing the road churning along beneath me and remembering a successful walk here made me want to return this part specifically. As I head east briefly towards my turning, a host of wild poppies colonise the mesh of a fence. There is life here, on the edge of things. As built-up Barking gives way to the flat, empty riverside plains of Dagenham, River Road turns south to edge along the Creek. As I trudged out to the junction where I'd turn, I noted a little knot of housing trapped between the road and the industrial area. It must feel strangely embattled here in what remains of Creekmouth - once a tiny village at the confluence of Thames and Roding, now more of a conceptual sales pitch for industrial sites which might one day be served by the Overground. These houses are an outpost - neither here, nor especially there. Creekmouth is gone, buried by refused and scrap metal. Once into River Road, the landscape quickly flattens out into low-rise brick units of industry; The junction crosses the Mayes Brook at an oblique angle which makes its last dive between the back gardens of houses to reach the Creek. The river isn't present at first - after passing under the A13 it makes a brisk eastward turn to run parallel to the Thames briefly, almost resisting its final destination. Eventually though, road and river are running alongside each other and the broad swathe of industry on the western side of the street is all that separates me from the muddy channel. River Road seems to run on forever, a long straight canyon of dust and debris. 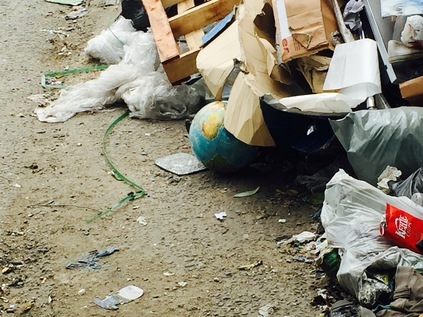 Piles of fly-tipped house clearances regularly interrupt the path - and one of them partially hides a globe: its dusty continents and battered reliefs peeking out from under the rubble. I finally reach the Waste Transfer Facility which by my calculation borders the Creekmouth Green Space - and it is an utterly horrible last barrier. An evil-smelling swirl of black liquid runs down the sloped entrance road and pools across the footpath, eddying rainbows of oils and fats twinkling up at me. The smell is incredible. Acrid, decaying refuse, sweet hydrocarbon, musty ancient river silt and the human tang of sewage. It fills my nostrils as I push at the creaking gate and walk up the rise towards the bank. I thought I'd built up a resistance in my years working on the edges of the care industry, but it overwhelms me sufficiently by the time I reach the river that it is beyond a mere smell anymore - now it's inside my head. I wonder with some horror whether I'll be stuck with this reek in my nostrils forever? It's an unfortunate time to be awestruck too as I turn, slack-jawed into the open at last- but the sharp-intake of tainted air is worth it: the Barking Flood Relief Barrier towers overhead. Up close, it is notable that the slender concrete pillars are studded with portholes. The idiotic capering figure on the Environment Agency logo shimmers in the haze of heat and pollutants atop each tower. Between the towers, the Isle of Dogs is framed perfectly in the distance. Beside me, the sweep of the Thames takes up the Roding's waters - now a broad estuary in its own right, but dwarfed by the might of the greater flow. I've seen wider vistas further east - bleaker, emptier frames of sky and river - but the end of Barking Creek has an end-of-things quality. I feel like I've walked a long, often fruitless trail from Debden, spending more time navigating the twists and turns of suburban East Ham and Ilford than I've spent on the bank of the river. But hemmed in by the infrastructure of the twentieth century I've honoured the course of this persistent watercourse. It's time to head back. I'm waiting for a bus on River Road when the rain starts. A small group of Central European factory workers dash over to shelter under the awning of an industrial unit where they converse languidly about BREXIT with regular shrugs and shakes of the head. I stay out in the refreshing storm. It won't last, and the cool clean rainfall is welcome. I see rivulets of black trickling from my hands where I'd picked up the road grime, and I smell the curious but never unwelcome aroma of dry dusty pavements getting wet. The bus finally arrives and we all board - heading back to civilisation and away from this spot which most of us would only ever visit under duress. Almost everyone except me.